Spencer Dinwiddie is a good basketball man with a good name and a slick, good-looking offensive game. He’s spent all but the first 46 games of his four-plus years in the NBA on miserable, rebuilding Brooklyn teams, which means neither his fun basketball skills nor his delightful personality have gotten the attention they deserve. Let’s work on that. The most telegenic part of his game is his lovely handles, and he spent Wednesday evening wrong-footing and dusting various defenders and defensive configurations. Early on the Sixers had the shrimpy but well-meaning TJ McConnell on him, and Dinwiddie drove him right to the bucket. When Brooklyn engineered a switch on the perimeter, Dinwiddie roasted Amir Johnson with a nasty right-to-left crossover and got to the front of the rim for a foul. He went left-to-right to dust JJ Redick and used a little eurostep finish to negate Joel Embiid’s terrifying shot-blocking prowess. 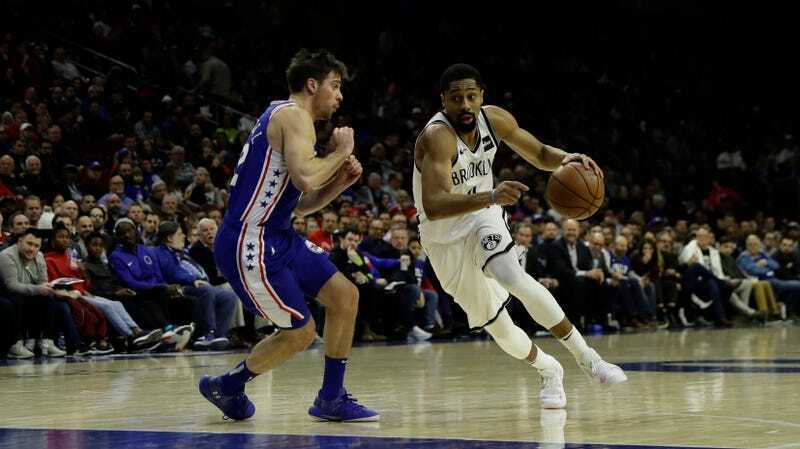 When the Sixers played conventional pick-and-roll defense and Ben Simmons got caught on the screen, Dinwiddie dribbled into a smooth wing three-pointer. Dinwiddie finished with 39 points on 18 shots in 31 minutes, and was a game-best plus-15, and that was all off the bench. While we’re here: Since Curry was drafted in 2009, there have been 30 instances of players scoring 39 or more points on 18 or fewer shots in a regular season game. You may be surprised to learn that Steph, who is one of the most explosive scorers of all time, has only managed the feat once in his career, or as many times as CJ Miles and Kevin Martin and Jodie Meeks. Kevin Durant has done it three times; Joel Embiid has done it twice; James Harden has done it four times. Dwight Howard once scored 39 points on only 13 shots, in a game in which he attempted 39 free throws! Okay. Back to the matter at hand. Spencer Dinwiddie is no Steph Curry, but he’s good. Good talk.